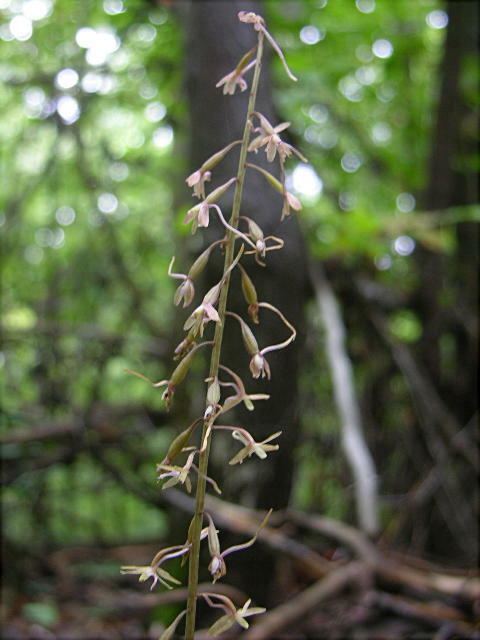 Putty Root or He and She Orchid (Aplectum hyemale): Single wintergreen leaf that over-winters before dying. This specimen is not in full bloom. 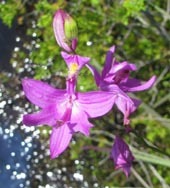 Usually considered to be green or yellow with deep purple on the edges like this when in full bloom. Photo by Jami Bladden. 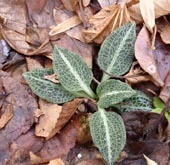 Downy Rattlesnake Plantain (Goodyera pubescens): Stem wolly. Woods. Photo by Dimitri Tundra. 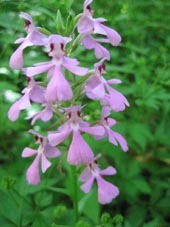 Lesser Purple-Fringed Orchid, (Habenaria psycodes). : Flowers smaller than the Greater Purple Fringed Orchid (Habenaria grandiflora) and the plant somewhat shorter. Otherwise identical. Location: Otter Creek Trail, MNF, WV. 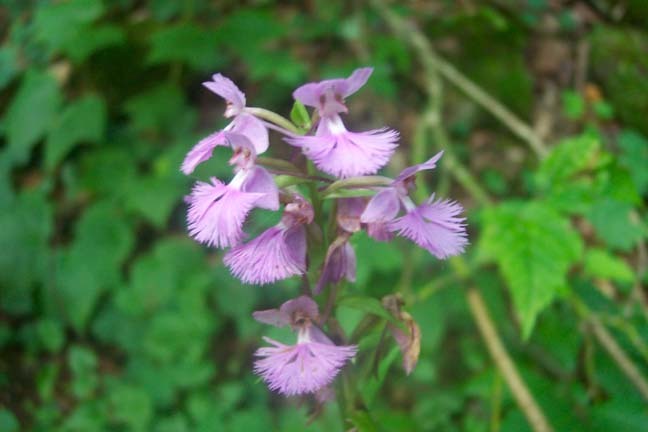 Purple Fringeless Orchis (Habenaria peramoena): Similar to the Fringed Orchis above but, obviously, sans fringes on the flowers. Photo by Russel Melton. Green Adder's-Mouth (Malaxis unifolia): Note the single mid-stalk leaf. 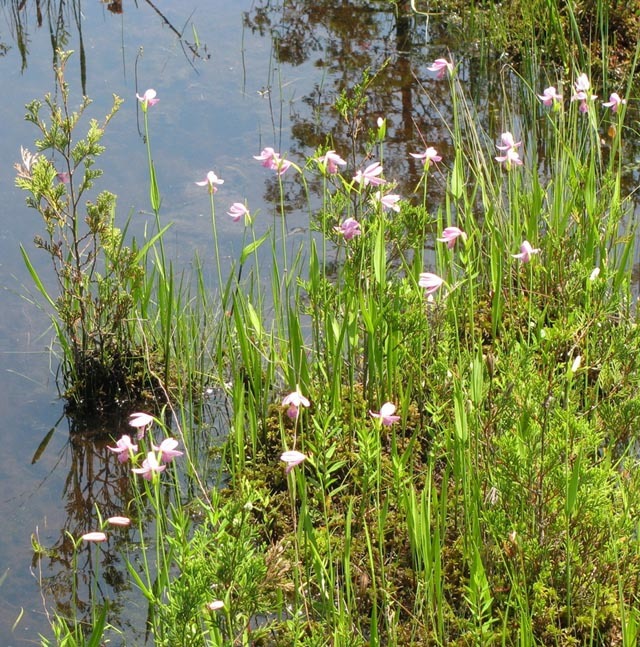 Woods, bogs and swamps. Photo by Dimitri Tundra. 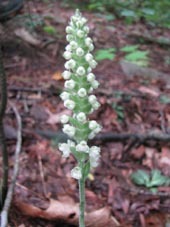 Nodding Ladies' Tresses (Spiranthes cernua): Flowers point downward. 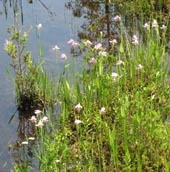 Bogs, meadows. Photo by Dimitri Tundra. 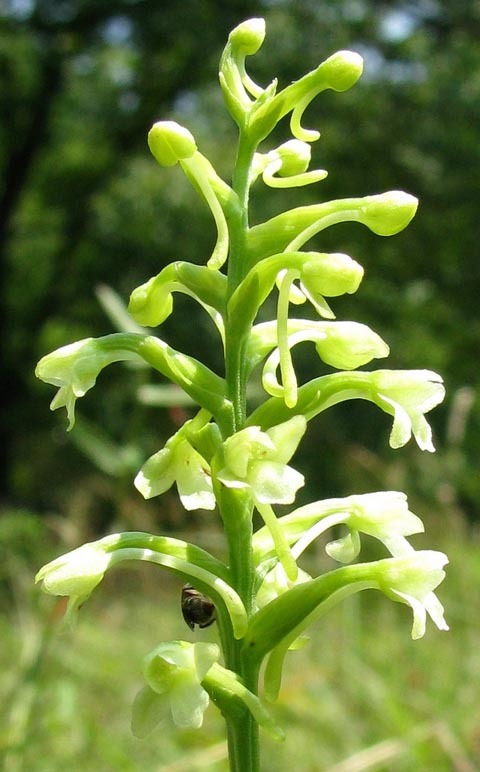 Yellow-fringed Orchis (Habenaria ciliaris): Grows in sunny open meadows and roadsides. 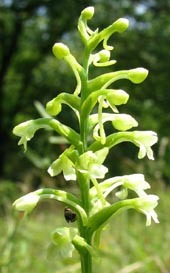 It's close cousin, the Crested Yellow Orchis (H. cristata), is very similar but has shorter flower spurs. 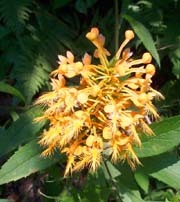 Location: Kaymoor/Cunard Tr, New River NR, WV. 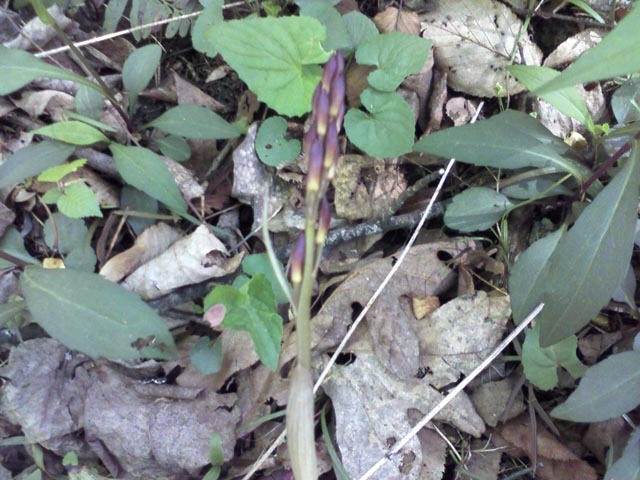 Cranefly Orchis (Tipularia discolor): Green-brown flowers on a leafless stalk. Grows in swampy areas. A single broad, lanceolete leaf sprouts in the fall and winters-over to wither away in the spring. Location: Jug Bay, Patuxent River, MD. Photo by Ken Clark. 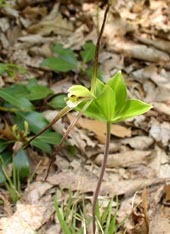 Whorled Pogonia (Isotria verticillata): Note the whorl of 5 to 6 stalkless leaves just below the flower. Photo by Dimitri Tundra. 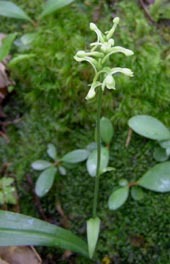 Small Woodland Orchid (Habenaria obtusata): One single basal leaf. 4 to 14 inches. Mossy bogs and woodlands. Photo by Dimitri Tundra. 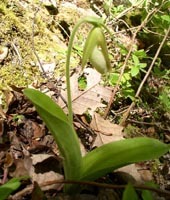 Albino form of the Pink Lady Slipper. Photo by Dimitri Tundra. 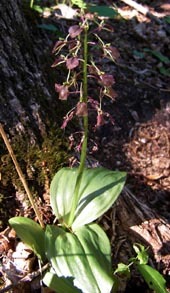 Bog Twayblade (Liparis loeselii): The two roundish basal leaves are reminiscent of Trout Lily. Photo by Dimitri Tundra. 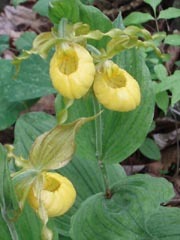 Yellow Lady's-Slippers (Cypripedum calceolus): In the orchid family. 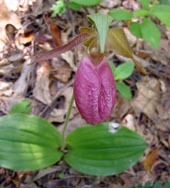 Related to Pink Lady's-Slippers. 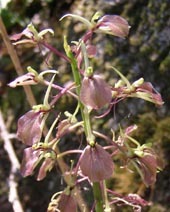 Two flowers on one stem (as shown here) is a rarity. 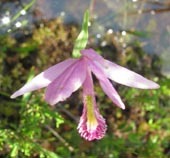 Location G. Richard Thompson WMA, VA.
Grass Pink Orchid or Colopogon (Colopogon pulchellus): One basal leave clasps the stalk. 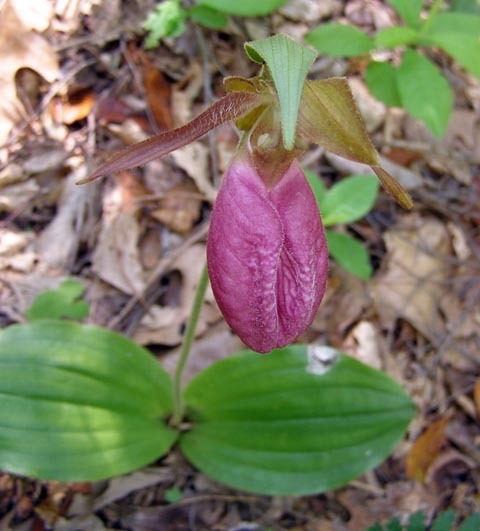 Found in bogs and swamps. Photo by Dimitri Tundra. 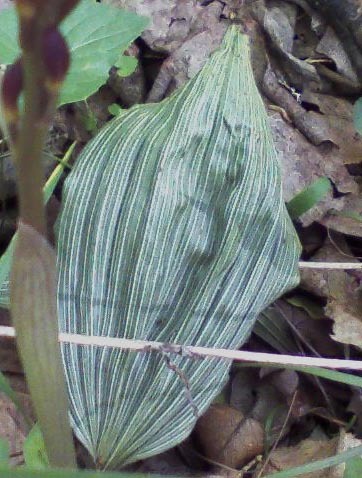 Rose Pogonia (Pogonia ophioglossoides): A single flower and one mid-stem clasping leaf. Another bog orchid. Photo by Dimitri Tundra. 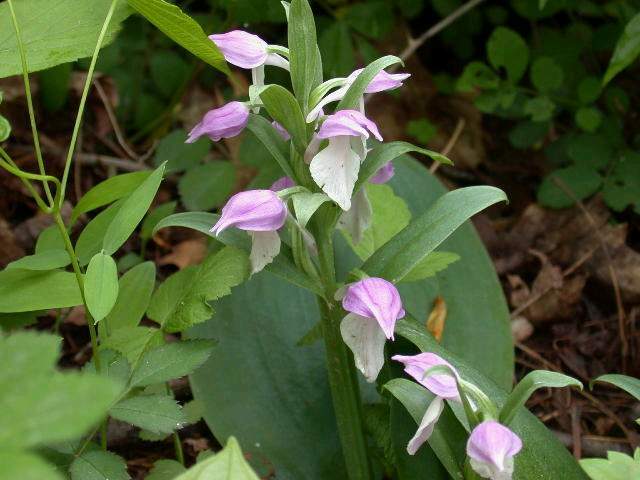 Round-leaved Orchis (Habenaria orbiculata): Note the two roundish basal leaves on this woodland orchid. Photo by Dimitri Tundra.